This section covers asphalt concrete-surfaced pavements (ACP), including ACP overlays on either asphalt concrete (AC) or portland cement concrete (PCC) pavements. Table 1 summarizes the various types of distress and unit of measurement. Some distresses also have defined severity levels. Measurement of crack width is illustrated in Figure 1. Figure 2 depicts the effect on severity level of a crack, in this case block cracking, due to associated random cracking. Occurs in areas subjected to repeated traffic loadings (wheel paths). Can be a series of interconnected cracks in early stages of development. Develops into many-sided, sharp-angled pieces, usually less than 0.3 meters (m) on the longest side, characteristically with a chicken wire/alligator pattern, in later stages. Must have a quantifiable area. An area of cracks with no or only a few connecting cracks; cracks are not spalled or sealed; pumping is not evident. An area of interconnected cracks forming a complete pattern; cracks may be slightly spalled; cracks may be sealed; pumping is not evident. An area of moderately or severely spalled interconnected cracks forming a complete pattern; pieces may move when subjected to traffic; cracks may be sealed; pumping may be evident. Record square meters of affected area at each severity level. If different severity levels existing within an area cannot be distinguished, rate the entire area at the highest severity present. A pattern of cracks that divides the pavement into approximately rectangular pieces. Rectangular blocks range in size from approximately 0.1 m2 to 10 m2. Cracks with a mean width £ 6 millimeters (mm); or sealed cracks with sealant material in good condition and with a width that cannot be determined. Cracks with a mean width > 6 mm and £ 19 mm; or any crack with a mean width £ 19 mm and adjacent low severity random cracking. Cracks with a mean width > 19 mm; or any crack with a mean width £ 19 mm and adjacent moderate to high severity random cracking. Record square meters of affected area at each severity level. If fatigue cracking exists within the block cracking area, the area of block cracking is reduced by the area of fatigue cracking. Note: An occurrence should be at least 15 m long before rating as block cracking. Applies only to pavements with unpaved shoulders. 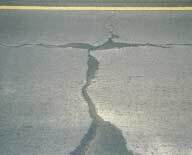 Crescent-shaped cracks or fairly continuous cracks which intersect the pavement edge and are located within 0.6 m of the pavement edge, adjacent to the shoulder. Includes longitudinal cracks outside of the wheel path and within 0.6 m of the pavement edge. Cracks with no breakup or loss of material. 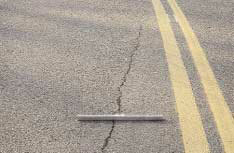 Cracks with some breakup and loss of material for up to 10 percent of the length of the affected portion of the pavement. 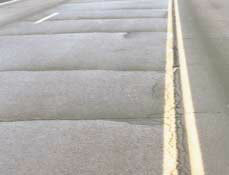 Cracks with considerable breakup and loss of material for more than 10 percent of the length of the affected portion of the pavement. 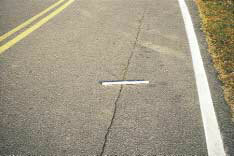 Record length in meters of pavement edge affected at each severity level. The combined quantity of edge cracking cannot exceed the length of the section. Cracks predominantly parallel to pavement centerline. Location within the lane (wheel path versus non-wheel path) is significant. A crack with a mean width £6 mm; or a sealed crack with sealant material in good condition and with a width that cannot be determined. Any crack with a mean width > 6 mm and £ 19 mm; or any crack with a mean width £ 19 mm and adjacent low severity random cracking. Any crack with a mean width > 19 mm; or any crack with a mean width £ 19 mm and adjacent moderate to high severity random cracking. Record the length in meters of longitudinal cracking within the defined wheel paths at each severity level. Record the length in meters of longitudinal cracking with sealant in good condition at each severity level. Note: Any wheel path longitudinal crack that has associated random cracking is rated as fatigue cracking. Any wheel path longitudinal crack that meanders and has a quantifiable area is rated as fatigue cracking. Record the length in meters of longitudinal cracking not located in the defined wheel paths at each severity level. 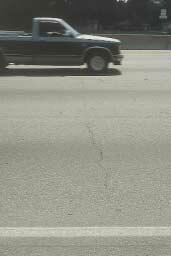 Cracks in asphalt concrete overlay surfaces that occur over joints in concrete pavements. Note: The slab dimensions beneath the AC surface must be known to identify reflection cracks at joints. An unsealed crack with a mean width £ 6 mm; or a sealed crack with sealant material in good condition and with a width that cannot be determined. Recorded as longitudinal cracking (ACP4) or transverse cracking (ACP6) on LTPP surveys. 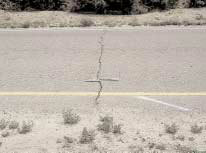 Cracks that are predominantly perpendicular to pavement centerline. Record number and length of transverse cracks at each severity level. Rate the entire transverse crack at the highest severity level present for at least 10 percent of the total length of the crack. Length recorded, in meters, is the total length of the crack and is assigned to the highest severity level present for at least 10 percent of the total length of the crack. 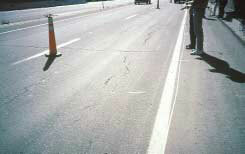 Also record length in meters of transverse cracks with sealant in good condition at each severity level. Note: The length recorded is the total length of the well-sealed crack and is assigned to the severity level of the crack. Record only when the sealant is in good condition for at least 90 percent of the length of the crack. If the transverse crack extends through an area of fatigue cracking, the length of the crack within the fatigue area is not counted. The crack is treated as a single transverse crack, but at a reduced length. Cracks less than 0.3 m in length are not recorded. Portion of pavement surface, greater than 0.1 m2, that has been removed and replaced or additional material applied to the pavement after original construction. Patch has, at most, low severity distress of any type including rutting < 6 mm; pumping is not evident. Patch has moderate severity distress of any type or rutting from 6 mm to 12 mm; pumping is not evident. Patch has high severity distress of any type including rutting > 12 mm, or the patch has additional different patch material within it; pumping may be evident. Record number of patches and square meters of affected surface area at each severity level. Note: Any distress in the boundary of the patch is included in rating the patch. Rutting (settlement) may be at the perimeter or interior of the patch. Bowl-shaped holes of various sizes in the pavement surface. Minimum plan dimension is 150 mm. 25 mm to 50 mm deep. Record number of potholes and square meters of affected area at each severity level. 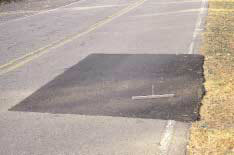 Pothole depth is the maximum depth below pavement surface. 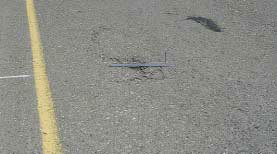 If pothole occurs within an area of fatigue cracking the area of fatigue cracking is reduced by the area of the pothole. A rut is a longitudinal surface depression in the wheel path. It may have associated transverse displacement. Not applicable. Severity levels could be defined by categorizing the measurements taken. A record of the measurements taken is much more desirable, because it is more accurate and repeatable than are severity levels. Specific Pavement Studies (SPS)-3 ONLY. Record maximum rut depth to the nearest millimeter, at 15.25-m intervals for each wheel path, as measured with a 1.2-m straight edge. All other LTPP sections: Transverse profile is measured with a Dipstick® profiler at 15.25-m intervals. Shoving is a longitudinal displacement of a localized area of the pavement surface. It is generally caused by braking or accelerating vehicles, and is usually located on hills or curves, or at intersections. It also may have associated vertical displacement. Not applicable. However, severity levels can be defined by the relative effect of shoving on ride quality. Record number of occurrences and square meters of affected surface area. 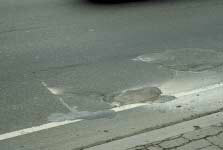 Excess bituminous binder occurring on the pavement surface, usually found in the wheel paths. 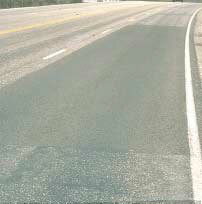 May range from a surface discolored relative to the remainder of the pavement, to a surface that is losing surface texture because of excess asphalt, to a condition where the aggregate may be obscured by excess asphalt possibly with a shiny, glass-like, reflective surface that may be tacky to the touch. Not applicable. The presence of bleeding indicates potential mixture related performance problems. Extent is sufficient to monitor any progression. Record square meters of surface area affected. Note: Preventative maintenance treatments (slurry seals, chip seals, fog seals, etc.) sometimes exhibit bleeding characteristics. These occurrences should be noted, but not rated as bleeding. Surface binder worn away to expose coarse aggregate. Not applicable. However, the degree of polishing may be reflected in a reduction of surface friction. Record square meters of affected surface area. 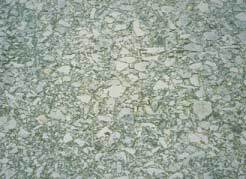 Polished aggregate should not be rated on test sections that have received a preventive maintenance treatment that has covered the original pavement surface. Wearing away of the pavement surface caused by the dislodging of aggregate particles and loss of asphalt binder. Raveling ranges from loss of fines to loss of some coarse aggregate and ultimately to a very rough and pitted surface with obvious loss of aggregate. Not applicable. The presence of raveling indicates potential mixture related performance problems. Extent is sufficient to monitor any progression. Record square meters of affected surface. Raveling should not be rated on chip seals. Difference in elevation between the traveled surface and the outside shoulder. Typically occurs when the outside shoulder settles as a result of pavement layer material differences. Not applicable. Severity levels could be defined by categorizing the measurements taken. A record of the measurements taken is much more desirable, however, because it is more accurate and repeatable than are severity levels. Not recorded in LTPP surveys. Seeping or ejection of water from beneath the pavement through cracks. In some cases, detectable by deposits of fine material left on the pavement surface, which were eroded (pumped) from the support layers and have stained the surface. Not applicable. Severity levels are not used because the amount and degree of water bleeding and pumping changes with varying moisture conditions. Record the number of occurrences of water bleeding and pumping and the length in meters of affected pavement with a minimum length of 1 m.
Note. The combined length of water bleeding and pumping cannot exceed the length of the test section.